This is a continuation of my Making a Homemade Crossbow project that I have been doing this winter. Stage 2A was to make a working trigger mechanism. 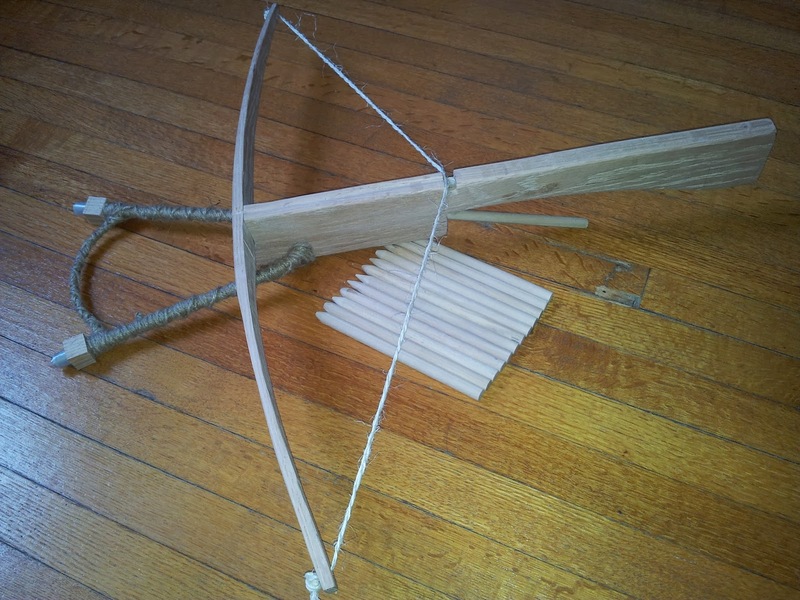 Stage 2B was to make a working stirrup so it is easier to load the crossbow in a hurry. As you can see in the photo below I have completed both halves of Stage 2. The stirrup is made of a single piece of 1/4 inch thick steel rod, bent into a V and then covered with Jute (a type of cotton similar to what is used for making burlap) which I knotted roughly every 5th loop so it would not come undone easily. The bottom of the stirrup is a thick / strong piece of woven jute, so that I can step on it and pull up on the bowstring to load the crossbow. To keep everything in place I corked the end of the stirrup with two cube pieces of oak with 1/4 inch holes drilled in them, and then finished it off with clear plastic hockey tape wrapped around it many times so it won't come off. Today I tested it several times shooting at a target 18 feet away and it has perfect accuracy at that range, despite the fact I am using unfletched wooden crossbow bolts. I have yet to test this crossbow at longer distances. The stirrup can be bent in other directions and can even used as a bipod (which improves accuracy due to extra stability), or as a rest so you can prop up the crossbow on a surface. Stage 3 will be to "beautify the crossbow" - using sandpaper, fine sandpaper and eventually shellac. 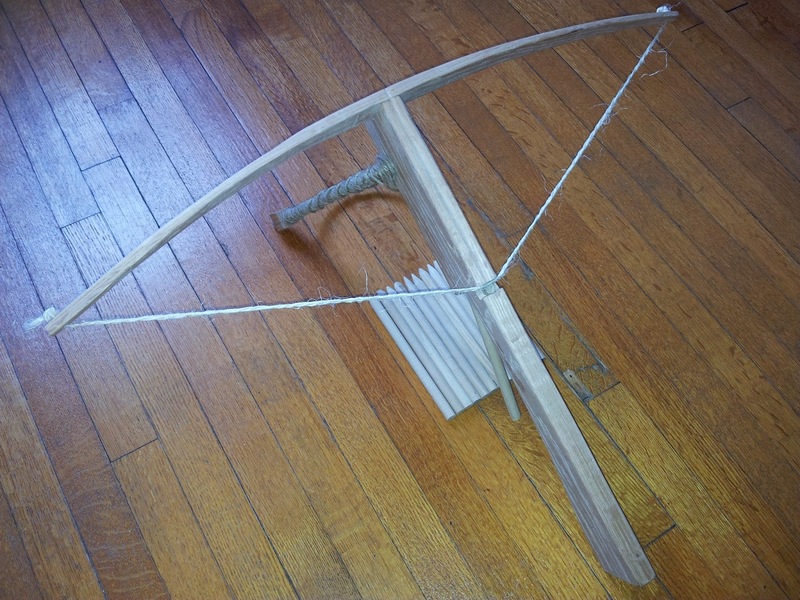 Stage 4 will be to create several small wooden crossbow bolts, complete with feather fletching and steel arrowheads. I may decide to shellac and beautify the crossbow bolts too. As you can see at this point the crossbow bolts are made, but are not fletched and don't have arrowheads yet. 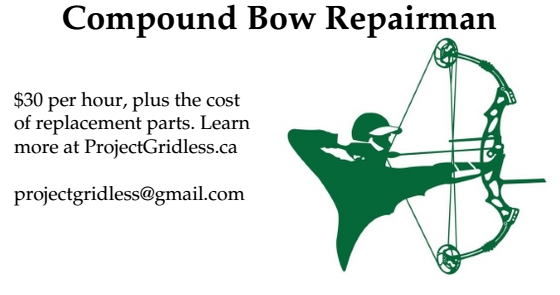 I will probably be purchasing the arrowheads from Basically Bows Archery at 940 Queen St. East, Toronto. I may purchase the feather fletching there too. I might also give this crossbow a name (Stage 6? ), but I haven't decided upon any possible names. Feel free to make suggestions by leaving a comment below. My 45# Bear Grizzly traditional recurve bow does have a name, Seahawk, and I have also given a name to my 36# hybrid pyramid bow, Ramses, which was made by Toronto bowyer Mike Meusel.